I decided to be a bit experimental and carefree with this design as it was ordered by a new customer who wanted something that is effortlessly stylish! Something she can change just like her outfit to reflect her style at that point in time. A set she can knot that has colours and simplicity blended to reflect her taste. Honestly, I was a bit reluctant because I thought it would be monotonous and boring, but she insisted and I obliged. Here, a lot of 4mm crystal rondelles were used. A few 6mm crystal rondelles were equally usedat the tail ends. Also used were some cone shaped beads. In between each bead was Preciosia czech seed beads. Total length is about 64inches per strand and they were 8 of them. When completed, the 8 strands where knotted and here is the result! Do I love it? Well, let me hear from you first! How would you knot your?! Nice job!! 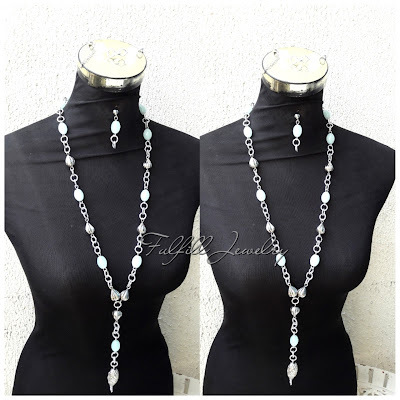 Stunning piece of necklace, it actually looks very appealing for a wedding ceremony. I think that such designs are a rare blend of contemporary and retro style. They can be very handy when you are looking for a graceful and gorgeous look. So true Jack, it's a piece I certainly would recommend for a wedding or an occasion that needs you to be all dressed up! Thanks a lot!